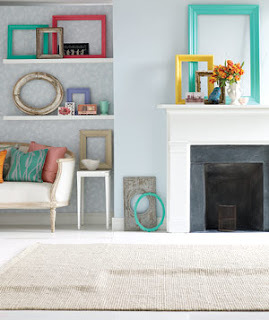 * Painting: This might seem obvious, but painting a room is the number one way to change its appearance. If you want a peaceful tone in a room, pastels in blues, greens and yellows can instantly make your room a haven of tranquility. If you're going for a more vibrant, energetic feel, brighter hues such as reds or oranges can give this effect. Sound like too much work? Consider an "accent wall". This is a wall that has a different color than rest of the walls in the room. You can then add little touches such as a shelf, picture, plant or that antique console or end table that you never knew what to do with. 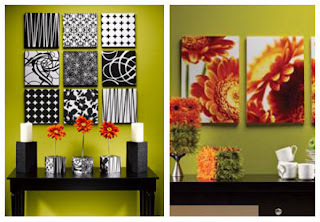 This wall can become the focal point of your room. You don't have to spend a fortune on paint either, and some of the "designer" brands are no better than the less expensive brands. * Slipcovers, cushion covers: If you have a couch or chair that has seen better days, but buying a new one is not in your decorating budget, you might want to try a slipcover. These come in various styles, fabrics & colors with some being loose-ftting & others that stretch & fit tightly over your couch or chair. Keep in mind that you can order custom-fitted slipcovers, but these are definitely more expensive than the regular, off-the-shelf variety. 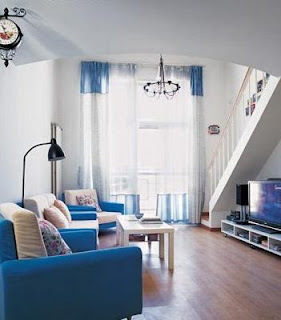 You would be amazed at the difference a slipcover can make in your entire room. Another alternative to a slipcover is a throw or afghan to drape across the back of your couch or chair. Also, just covering your cushions or buying new ones can breathe new life into a tired sofa and brighten up the room. Feeling ambitious? Visit your local fabric store & check out the variety of upholstery fabrics available. 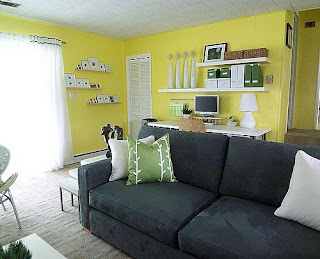 You could try just covering your sofa cushions or pillows, or cover the entire couch or chair. There is plenty of information online or in books on reupholstering furniture. * Small Touches: As mentioned above, decorating your home on a budget doesn't mean having to spend all your free time doing it. Sometimes just clearing off a cluttered table and adding an inexpensive vase with some fresh (or silk) flowers can refresh a room. Shop around at consignment stores, flea markets and yard sales for second-hand furniture, vases, artwork, etc. If the furniture isn't in perfect condition, but has a few scratches, these can easily be covered with touch-up varnish kits or a coat of paint. Artwork & vases or other decorative items needn't be expensive to make a big difference. Go to a discount store and buy a new pair of inexpensive drapes or a valance to instantly revitalize a room. Window scarves can add a unique and sophisticated look to room as well. For a bathroom, just replacing your old, mildewy shower curtain with a new one can make a huge difference, or add a new throw rug, hand towels or other bathroom accessories instead of doing an all-out remodel. Create an Oasis No Matter How Small: As a mom to a pre-schooler, I'm no stranger to clutter. And when I look around and see clutter, I immediately start feeling stressed. Since I can't keep my home perfect, or even close, I've found that just clearing off one area, such as my coffee or dining room table(especially if I've been meaning to do it for a long time), can change my mood instantly. 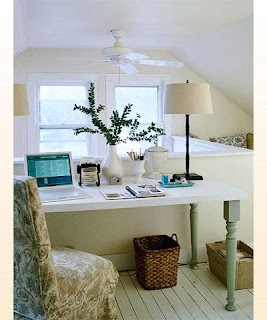 Just having one area of calm without clutter, can be an instant mood-lifter. Also, rearranging the furniture from time to time can breathe new life into a room and open up space you didn't know you had. Indoor fountains and candles are another way to add to your "mini-oasis", and I'm a big fan of both. Nothing is as relaxing as water, and an indoor fountain set either on the floor(the dog or cat may want to use it as his personal circulating water bowl, however), or on your newly-cleared off tabletop can be the perfect calming touch and can also make a big change in the room. To go with your budget decorating, there are many inexpensive indoor fountains available. Place a candle near your fountain and you will instantly create a calm and relaxed mood in your room without breaking the bank. Hanging wind chimes near an open window or a ceiling fan can be very calming. I know all of this may sound a bit like "feng shui", and in fact incorporates some of the elements of it. It might not sound like redecorating, but the point is that small changes can make a big difference in your home and in your mood.